ARRIGO. On March 11, EDGAR, aged 70, passed away peacefully comforted by the rites of Holy Church. He leaves to mourn his loss his beloved wife Alice, his daughters Anita and her husband Robert Grech, Julia and her husband Mark Valentino, his sons Simon and his wife Stephanie, Mark and his partner Rebecca, his treasured grandchildren Luke, Benji and baby Emma, to whom he was a much loved nonno, his brother George and his wife Lorraine, in-laws, nephews, nieces, cousins, other relatives and friends. The funeral cortège leaves Mater Dei Hospital tomorrow, Friday, March 22, at 8.30am for St Julian’s parish church where Mass præsente cadavere will be said at 9am followed by interment at Santa Maria Addolorata Cemetery. Lord, grant him eternal rest. BORG. On March 19, at Mater Dei Hospital, Dame MARIA ADALGIZA, of Żebbuġ, residing in Attard, aged 80, passed away surrounded by her loved ones. She leaves to mourn her loss her husband Alfred, her son Joseph and wife Sandra, her daughter Isabel, and her son Gordon and partner Clare, her granddaughter Francesca and partner Carl and great-granddaughter Kate, her grandsons Matthew, Luke and Gabriel and granddaughter Sara-Ann, her brother and sisters, relatives and friends. 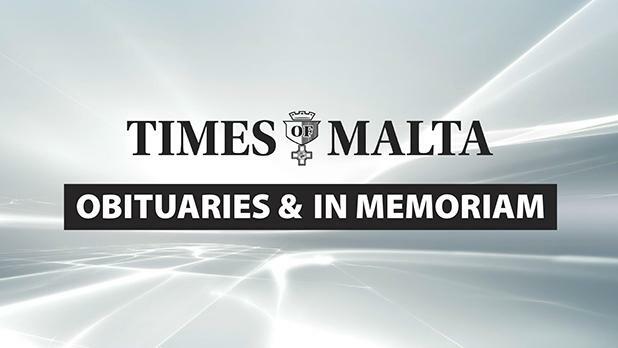 The funeral leaves Mater Dei Hospital today, Thursday, March 21, at 1.30pm, for Attard parish church, where Mass will be celebrated at 2pm, followed by interment in the family grave at the Santa Maria Addolorata Cemetery. Donations to the Ursuline Sisters, Sliema, will be greatly appreciated. No black attire is to be worn. Lord, grant her eternal rest and peace. BUHAGIAR. On March 20, JOHN BAPTIST, of Siġġiewi, passed away peacefully, aged 86, comforted by the rites of Holy Church. He leaves to mourn his loss his son Dion and his wife Denise, Joseph and his wife Marianne, and his beloved grandchildren Kenneth, Kristina, Roberta and Andrew. Mass praesente cadavere will be said on Saturday, March 23, at 3pm, at Siġġiewi parish church followed by interment at the Siġġiewi Cemetery. No flowers by request but donations to Id-Dar tal-Providenza, Siġġiewi, would be appreciated. Lord, grant him eternal rest. BUHAGIAR. On March 20, at Mater Dei Hospital, MELITA née Borda, of Sliema, aged 99, passed away peacefully comforted by the rites of Holy Church and surrounded by her immediate family. She leaves to mourn her loss her beloved daughter Marie and her husband Godfrey Demicoli, her grandson David and wife Rebekah, her granddaughter Kirsten and husband David Darmanin and her great-grandchildren, her sister in-law, nephews, nieces, cousins, other relatives and friends. The funeral cortege will leave Mater Dei Hospital tomorrow, Friday, March 22, at 1.30pm for St Gregory The Great parish church, Sliema, where Mass praesente cadavere will be said at 2pm followed by interment in the family grave at Santa Maria Addolorata Cemetery. No flowers by request but donations to id-Dar tal-Providenza, Siġġiewi, will be greatly appreciated. Merciful Lord, grant her eternal rest. The family would like to thank nurses and carers at Casa Antonia for their care and dedication during the many years she spent there, as well as doctors, nurses and carers at Mater Dei Hospital Orthopaedic Ward 3. CASSAR. On March 20, EDWARD, of Sliema and residing in Wardija, aged 66, passed away peacefully comforted by the rites of Holy Church. He leaves to mourn his loss his son Sean and his wife Amanda, his mother Jane, his brothers and sisters Albert, Anna, Tony, Henry, Richard and Vicky, their respective spouses, his nephews and nieces, other relatives and friends. The funeral leaves Mater Dei Hospital tomorrow, Friday, March 22, at 1.30pm, for St John of the Cross parish church, Ta’ Xbiex, where Mass præsente cadavere will be said at 2pm followed by interment in the family chapel at Santa Marija Addolorata Cemetery. No flowers by request but donations to id-Dar tal-Providenza, Siġġiewi, will be greatly appreciated. Lord, grant him eternal rest. SALIBA. On March 19, at the Maltese Jesuit Mission in India, Fr EMIDIO SALIBA, S.J., aged 76, went to meet the Risen Lord, comforted by the rites of Holy Mother Church. He leaves to mourn his loss his brethren in the Society of Jesus in Malta and India, his brother Joseph and his wife Mary, his sisters Mary, widow of Harry Fsadni, Sister Lydie of the Little Sisters of the Poor, Carmen, widow of John Lia, relatives and friends in Malta and India. Donations to the Jesuit Mission in India (38, Loyola House, Naxxar. NXR 2069) will be greatly appreciated. May he rest in the peace of the Risen Lord. SCHEMBRI. Prayers are requested for the repose of the soul of Fr GUIDO JOSEPH SCHEMBRI OP, who passed away on March 20, aged 91. Requiem Mass præsente cadavere will be celebrated at St Dominic’s priory church, Rabat, tomorrow, Friday, March 22, at 9am. Interment follows at the Santa Maria Addolorata Cemetery. May he rest in peace. Tomorrow, being the trigesima die since the demise of ISABEL GERA, a Mass for the repose of her soul will be said at 6.30pm at St Patrick’s church, Sliema. BORG. In ever loving and unfading memory of ELVIRA, wife of the late Philip Borg, a dear and loving mother, today the 42nd anniversary of her demise. Fondly remembered and deeply missed. Her children. CARUANA COLOMBO – Judge JOSEPH CARUANA COLOMBO. In treasured memory of our beloved father who died on March 21, 1986. Victor and Liana. COLEIRO – MARTHA. In ever loving memory of my dear mother MARTHA, née Vincenti, on the 62nd anniversary of her death. Remembered with love by Maria and family. Lord, grant her eternal rest. FARRUGIA – TONY. In loving memory of our dear father, today being the anniversary of his passing. Fondly remembered by his children Anthony, MaryAnne, Christian, Francesca and Nikki. FARRUGIA – TONY. In loving memory of our dearest nannu, today the anniversary of this death. Greatly missed by his grandchildren Philip, David, Martina, Julian, Matthew, Alexia, Sarah, Allan, Andrea and Alexander. NAUDI – MARIKA, née Hili. Remembering a dear wife and mother on her birthday. Hector, Karl and Nadine and their children. NAUDI – MARIKA, née Hili. Remembering our dear daughter on her birthday. Mama. NAUDI – MARIKA, née Hili. Remembering our dear sister on her birthday. Beppe, Edith, Marin, Erika, Paul, Angela, Lilla, Gino, Melo, Fiona and their children. STAFRACE – DOMINIC, 213.1973. Never forgotten. Salvinu and family.